Background: Facial structural weakness is most commonly associated with the lower face, the chin and jawline. This is easy to identify because these are protruding structures that are at the junction with the neck and there is a natural demarcation between the jawline and the neck. 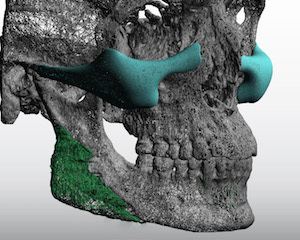 Skeletal weaknesses of the upper face are harder to identify because sharper transitions between facial structures are less distinct and the structures do not have well defined projecting points. Under eye hollowing and its skeletal anatomy is the most under diagnosed of all facial skeletal deformities in my experience. It is seen in young people by the presence of extended tear troughs that create a whole under eye hollowing effect. Dark circles, the appearance of being tired and pseudoproptosis of the infraorbital fat pads are all classic signs of it. Having a negative orbital vector from the side view is a classic physical finding and verification of bony infraorbital hypoplasia. But rarely does infraorbital hypoplasia exist alone. This is because the infraorbital bones and the the zygoma are connected both anatomically and developmentally. If one is deficient the other one usually is also. Treatment of under eye hollowing is most commonly done with injectable fillers or fat. But it is important to appreciate that this type of under eye hollowing is not age-related (although the appearance does get worse with age), it is a developmental facial structural deficiency. Case Study: This male was bothered by his significant under eye hollows and weaker cheeks. He wanted to have more definition to his midface as well as improve his gaunt facial look. 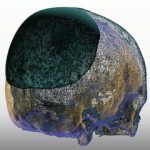 Using a 3D CT scan, custom infraorbital-malar implants were designed that augmented the entire infraorbital rim extending out on the cheeks and back along the zygomatic arches. The cheek part of the design extended down onto the submalar region for improvement of his cheek hollowing. While injectable treatments are common approaches to under eye hollowing, they are often not effective and, even if they were, are not a good long-term solution. 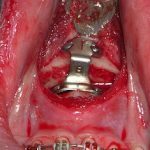 Traditional tear trough implants, while providing some benefit, do not cover enough surface area to be ideally effective. A custom implant approach offers coverage of the complete bony areas that make up this type of midfacial aesthetic deformity. 1) Undereye hollowing is often associated with a flatter cheeks as part of the overall infraorbital-malar facial skeletal hypoplasia. 2) Augmenting the under eye and cheek area together is best done with a custom infraorbital-malar implant design. 3) Placement of custom infraorbital-malar implants is usually done through a lower eyelid incisional approach.